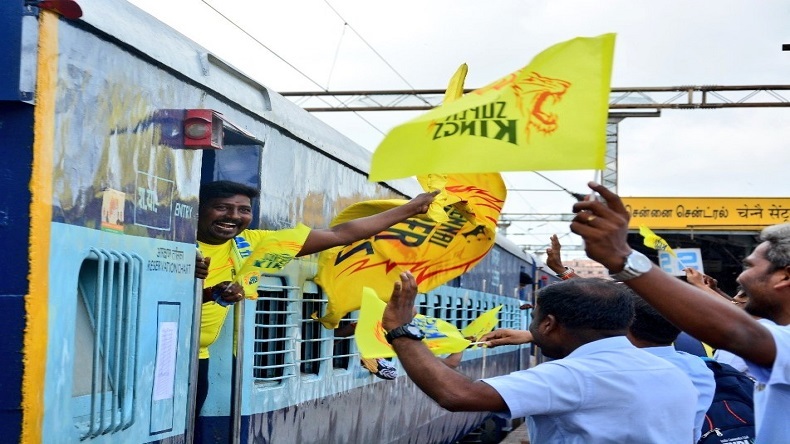 The Chennai Super Kings on Thursday flagged off the 14-coaches Whistlepodu Express from Chennai Central to take thousands of their fans to Pune. The franchise has also decided to bear all the expenses by Yellow Brigade, including food, accommodation charges. Due to the Cauvery issue, several protests triggered across Tamil Nadu, which lead BCCI to move IPL matches out of Chennai. After Board of Control for Cricket in India (BCCI) decided to shift Indian Premier League (IPL) matches out of Chennai due to Cauvery issue, the Chennai Super Kings organised a special train to carry thousands of Yellow Brigade fans to new venue Pune, where Mahendra Singh Dhoni lads will take on Rajasthan Royals. The 14-coaches train called ‘Whistlepodu Express’ flagged off from the Chennai Central station. The franchise has also decided to bear all fans expenses which include food, travel fare, accommodation charges, match tickets, jersey. According to the press release made out by CSK, 4 venues were offered to the franchise, but the 2-time IPL champions decided to go with the Maharashtrian city. It was really disappointing for the CSK fans to miss the matches played by CSK on their home turf, but fortunately, the franchise decided to help fans. According to the reports, one of the most popular followed team in franchise cricket were asked by the groups of fans to offer them the discount. Soon after the fans approach CSK management, they coordinated with the Indian Railways to arrange a special train for them. According to Prabhu, a key member of CSK official fan club, we conduct blood donation drives, orphanage visits and things like that. So, these guys are the ones who volunteer for such things. The rest we picked through social media by verifying the match tickets they got for the Chennai games. However, the fans are still not happy, as they are going miss the ‘yellow sea’ supporting their team at the MA Chidambaram Stadium, Chepauk. Other than young fans, old, woman, child find difficulties to travel long distance. This is an unprecedented move by CSK, as not many sports franchises take this kind of decision for their fans. In recent days, Cauvery row has triggered protests all across the Tamil Nadu.